– You received a number of trainings and technical assistance, and continue producing the same amount as before. Haven´t they done anything for you? – You did not improve for years, and suddenly for the last 5 years you are producing twice the amount in the same area, is that from luck? Did you wake up? A lot of studies make an argument in favor of technical assistance and for the rational use of chemical or oganic inputs; the last proposal along these lines is the one presented by FUNIDES in the beginning of 2012. In fact, the country has undergone various development models of technological change, including the renovation of varieties and the genetic improvement of the livestock; these models include IAN under the Somoza government; CONARCA Plan introducing the caturra variety in the decade of the 80s, as well as the subsidized and State-centralized technical assistance services; privatization of the technical assistance services and strong leadership in the model of the multilateral organizations and bilateral aid agencies between 1990 and 2006; and the model of the “return” of the state along with “packages” for reducing poverty like “zero hunger” or the “production bonus” after 2007. A quick review of the data shows us that the coffee yield continues to be 8.5qq without change over the last 30 years. The same thing happens in ranching, one cow on 2 mzas of land or producing 3 liters of milk a day. In spite of huge efforts and resources, productivity is similar to 40 years ago, and when we compare ourselves to our neighbors in Central America, Nicaragua shows itself to be very backward. In this article we argue that the productivity is not improving due to the fact that the policies are based on an understanding of production as something technical, as an exclusive matter of engineering, focused on the item in question. The concept of productivity that includes land, capital and labor does not appear in the dominant vision, not even land as a space for diversified farms that according to Maldidier y Marchetti (1996) predominates in the country; in the dominant vision one item matters on the land (farm). In spite of the different technical assistance models in the last 30 years, all express this reductionist approach: they see the item, not the farm; they see the man and not the family, nor the social networks, they start from the assumption that the producer is ignorant and poor, and see the rural reality from the perspective of a large business person specialized in a crop or in a purpose (milk or meat) for the livestock. Thus the policies are improving the variety of the crop and improving the breed in large and small livestock, and the technical assistance focuses on the item. The following tables show that productivity is stagnant. Source: Based on agricultural census of 1963. The data for 1997 – 2005 comes from MAGFOR. Source: Based on the 1957 – 58 Coffee census, agricultural census of 1963. The data for 1999 – 2001 comes from UNICAFE and the data of 2007/8 comes from MAGFOR. Source: Based on agricultural census of 1963. The data of 2001 comes from the Agricultural Census, the data for te production of milk for 2001 comes from MAGFOR. In this article we focus on studying productivity around the coffee crop (“golden grain”). Given that most of the coffee area is mostly in the hands of small producers, and in the northern central region of the country, and given that it is calculated that 70% of the coffee produced in Latin America is in the hand of small producers, their productivity is close to their historical levels (11qq/mz in 1982 and in 2009-2010). And in the case of organic coffee, technology introduced at the end of the 80s, different studies conclude that the yield is even lower than in conventional coffee; it is a coffee mostly produced by the poorer families and those farthest from the market (roads); and it is a crop whose bonus (for being organic) apparently does not compensate for its low yield. After this introduction, little by little we open windows to confront various realities: the area of the farm and that of the families, that of the institutionality that surrounds them, the policies that support the extensive path, and the non contingent awareness itself of the producers and service providers. In the end we present a proposal for innovation that a cooperative in El Cua is carrying out. 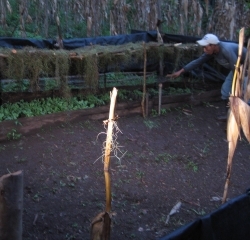 The dominant explanation focuses on the technical part, and thus the technical assistance focuses in around the management of plant tissue, pruning, renovation, application of inputs – the myth is that productivity is in the plant and within the farm, and it is the responsibility of the producers and no one else. Some institutions that focus on coffee quality also include the (selective) harvesting of the coffee and management of the wet mill (e.g. use of water, type of wood, care with honey waters and use of the pulp). In our experience, not only does production need to be improved, but the loss of coffee needs to be avoided; coffee is lost in the time of the harvest due to the scarcity of labor, it is lost in the dry milling because of deficient calibration of the huller that allows grains to pass through, and because the sieve for the drier has holes, coffee is lost in the weight control where the merchants- buyers generally take advantage, coffee is lost because of the coffee rust and tracnosis due to deficient management. From all this we estimate that between 20-30% is lost because of bad arrangements with the workers (coffee picking), from lack of care in the wet milling process, and because of the management in those same points, including the transportation of coffee later to the collection center, and because of lack of information on markets that pay for coffee quality. On this last point, it is common to find producers whose certified coffee (fair trade, café practices and organic coffee) are sold as conventional coffee, which obviously is not just a loss of better prices (income) but expenses incurred for that certification that ends up affecting the producers. Nevertheless, reviewing producers who have been clients for years of the micro-finance institutions and of the private banks, it is difficult to find a correlation between access to credit and productivity. Reviewing the high productivity families, in general they have the following characteristics: culture of savings; low alcoholism; relative family stability (less lovers and children outside the family); and capacity for investment (more diversified farms, more populated coffee fields, and planted in association with bananas and fruit and wood trees, depending on level of incline and humidity). One key characteristic is producers that are members of dynamic cooperatives with their own capitalization and access to loans that do not compromise their properties, e.g. international financial institutions like Root Capital and Alterfin/Repsonability provide credit based on coffee sale contracts, and organizations like Winds of Peace, based on organizations with the decision to capitalize. Productivity has to do with a culture of savings/investment, of administering their own resources, and of having an attitude of improving step by step. If a family capitalizes gradually, like their organization (e.g. first tier cooperatives), the signs of improvement in productivity are more evident. In the decade of the 80s and the beginning of the 90s the collective cooperatives had very low productivity levels: the producers did not make an effort due to the fact that they did not feel that the properties were theirs. This situation improved when the de-collectivization process moved forward, and second tier cooperatives were organized to export their coffee under the fair trade seal. In other words, the productivity improved when the form of cooperative organization changed, which shows us that productivity is connected to social processes and can improve. Something similar happens with the phenomenon of the inheritance, an issue that we are studying and will come out in another article. The case of the conversation with Gonzales at the beginning of this article is revealing: if the inheritance is not defined, then there are no incentives for putting the maximum effort into it. Typical expressions in this sense are: “If I strongly invest in this coffee field, it could be that my brothers will be more demanding in their claims for it as an inheritance”; “if suddenly it is not going to be left to me, then why exert myself?” “If I give him his inheritance now, it could be that there might be a falling out and I might have to die abandoned.” In other words, if a family has their inheritance undefined and it includes coffee, it doesn´t matter how many training sessions and technical assistance they receive, the productivity of the coffee and any other crop will not improve. The institution of inheritance is decisive, practically affects all families from generation to generation. In other cases, even when the inheritance is defined, and regardless of the form of cooperative organization, the level of family organization has an important impact, both the nuclear family (parents and children) as well as the extended family (families of brothers, sisters, cousins and aunts and uncles). At the level of the nuclear family, when parents and children divide up the roles/tasks, the coffee productivity and the productivity of the farm improve substantially. In La Pavona the case of the Rivera family illustrates this: “we took the farm with a huge debt, so we organized with my sons and daughters, my oldest son is in charge of the farm, the one that follows him is in charge of the collection of the harvest and the tranportation, my wife in charge of the administration, my daughters and daughters in law are responsible for responding to the workers, and I am responsible for the wet milling; working in this way we freed ourselves from debt, we are investing to improve this coffee even more, and each son/daughter has their part of the profits.” This type of family is fertile ground for good technical assistance, as has been the case of the Rivera family whose productivity improved 100% in a ten year period. The extended family also has an impact, be that in increasing the productivity, or for keeping it stagnant. In the Divisiones del Cua community, we found a very revealing case: 3 related families had high productivity, while other families did not. What was the reason? We found that the entire extended family tended to meet relatively frequently around social activities, and in those encounters a certain amount of cooperation and competition was generated among themselves, some realized that the cousin or uncle had a “good coffee field” and so reacted, “if my cousin is harvesting more than I am, why can I not do it?” or the opposite “your coffee is bad, why don´t you improve it like I did?” With other similar groups but that did not have within them high productivity people, you do not find incentives for competing among themselves, rather one conforms to the other, and so they do not improve their productivity not matter how much technical assistance they might receive. Reflecting on both groups, we found that there were no “bridges” between both groups of extended families, partly because they are from different social extractions, they are like a “club” with barriers that block the entrance to other families – “it is that we are meeting as a family, what business do others have there?” – is the expression. The cooperative brings together both types of families, but is not able to make that space a common one for passing on productivity, because the cooperative is understood as a place to negotiate resources and to sell coffee, not for creating spaces for innovation and struggling with your own resources. From this we learn that understanding the social networks and their levels of internal competitiveness matter a lot, as places for improving their productivity with or without technical assistance, and it makes more of a difference to work on the possible “corridors” between different social groups. Finally we have a case of a cooperative with policies that promote productivity and that in some way have been able to be a “corridor” between a dozen families. It is the case of the José Alfredo Zeledón cooperative of San Juan del Rio Coco. This case shows that a cooperative that is capitalized can also push the member families to capitalize, influence them to low consumption of alcohol, and encourage them to “think of the family” administering their resources well. In this cooperative their members receive 80% of their demand for credit, are improving their administration, are maintaining well and investing in their farms, they are cultivating a holistic vision of productivity (“good for the coffee, good for the bananas, good for everything that we are producing on the farm”). One of the secrets of this cooperative is that they have policies for integrating new members on the basis of their founding group, so have 150 members that come from around 14 families. In this way the coffee productivity has increased 100% over a 15 year period. This improvement is not just in conventional coffee, but also in organic coffee. So far we have tackled the farm, the administration of resources (financial, human) up to institutional and social elements. We are missing the policy part that has to do with the framework that sustains the “extensive technology” and the non contingent awareness of the world. Concerning the former, even though there are almost no more forest areas to go into, historically the “domino effect” has persisted about the advance of the agricultural frontier (Mendoza, 2006). Far from being a purely technical matter, just as we have seen so far, the “extensive culture” is sustained on the basis of a strongly institutionalized dispossession. The “domino effect” consists in the fact that the large producer located close to the cities tries to buy farms from medium scale producers, and this one in turn off of small producers…It is a pressure accompanied by a different type of violence, from negotiating above board (openly) up to closing down roads, stealing cattle and fencing, threatening, and even with implications of death. This dispossession process is injected with bank resources and the microfinance institutions that are providing credit to those who have “the ability to pay” and collateral in material assets, by state institutions and different organizations that do not believe in the capacity of peasant families, and instead limit their support to the technical aspects, ignoring this world of power relations. Thus the “effect” travels far away and the pressure is felt in the mountains and beyond the borders; the affected peasant families located in the new agricultural frontier would say that they are like rocks, that they have been “rolling down hill” since the time of their grandparents, or that they are losing family members who are escaping to neighboring countries in search of work, which means “human capital flight”, peasant workers with different know-hows, which in the long term affect their own communities. Maybe one of the most problematic points is that “providential” consciousness that the world (let´s say productivity) is a given. And from that understanding, the action of technical assistance tends rather to contribute to that providential belief (“If the technicians themselves have not been able to get us to increase production, it is because it is the will of God”), or to luck (“that guy has better production because by luck he got better land.”). This leads us to the need to understand that technological change has to do with power relationships, and with the attitudes of both the producers and the state institutions and aid agencies in general. Each organizaton that works with the producer families needs to reflect on the impact of each one of its actions, with this we are not refering to the effect of their technical assistance in terms of crops, but the impact on the farm and the families, like for example the danger of rather accenting a providential consciousness that works against citizenship and the formation of actors with their own voices and decisions. They are stable families since the decade of the 50´s and with a coffee tradition of 2 to 3 generations. 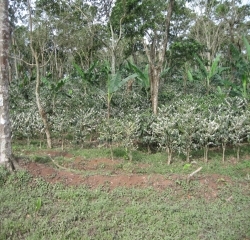 There are small and medium coffee growers; aid also includes the medium scale producers. They have differentiated productivity: traditional coffee with 6 quintals export quality coffee per manzana and semi-technified production iwth 14 quintals per manzana; they still do not have members with technified production of coffee, that they calculate would have some 25 quintals of export coffee per manzana (see Chart). How did they jump from traditional to semi-technified? First, the motivation (ambition): 1) there is a transfer of knowledge from one generation to another, 2) “They get inspired by the large producer” (by the person in the semi-technified stage), 3) and in the technical assistance that they received. Secondly, the families in the semi-technified stage were able to combine resources and their good use, apply the inputs in a timely fashion, they take advantage of the knowledge transferred from their parents. Third, family stability and belonging to a group of 3 families, infecting one another and competing with one another to improve their coffee fields. In 3 years a B (semi-tecnified) member will make a C member (traditional) make the jump to B; for that purpose groups of 5 B members will be formed who will share their experiences of making C producers advance; each group has a coordinator who in turn will be part of the productivity commission of the cooperative. One effect of this process will be that, to the extent that B is successful in his work of graduating up the C, the B producer will also jump to level A (technified). Consequently, to the extent that the C members jump to B and the B to A, the cooperative will become a leader in the community with influence in other communities. Under what rules and strategy would this innovation be possible? To be part of the administrative council you would need to be a B member, and in two years when they are able to have A members, then to be a member of the council you would need to be an A member. This provides a clear signal about what it means to be a leader, and that all can be leaders depending on their productivity improvements. Also policies are defined that provide incentives for the producers to make an effort to increase their productivity: the C producers have 3 years to quit being C and moving into the B group; on the contrary, the interest rates on the loans they receive would include an additional 2% compared to the interest rates for the B members. The same then would be true after 3 years to move to the A group. In order to sustain this innovation, the cooperative needs to capitalize, build alliances, and cause a change in the mentality of its members. The idea is that if the producers improve, the cooperative will also improve, and viceversa. So they will be capitalizing based on: 1) their own contribution, 2) the negotiation of credit to later capitalize themselves with 2% of additional interest charged, 3) negotiations with private enterprises to commercialize coffee that is not committed to their second tier organization, earnings from this commercialization will increase the capital of the cooperative. For this latter purpose a medium term relationship with the Winds of Peace Foundation is being established that provides them with credit, and they are seeking out institutions with the capacity to dialogue about agricultural technology and cooperative organization to be their strategic allies. 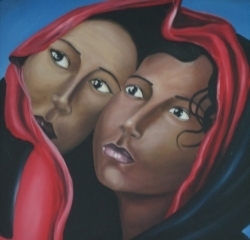 This process is a response to their mentality of understanding that they need to resist and triumph, precisely in order not to be dragged in by the “domino effect” of dispossession. The greatest investment on the part of the state and of international aid is in the technical aspect, which then is “translated” in terms of dispossession against the most economically vulnerable families in line with what has been called “extensive technology”. The “social machinery” is like the “land” where this seed (technical assistance) falls; and given that this “land” is unknown, the desired productivity does not happen. The lesson that we take from this is the need to study the farms, the families, their institutions and the social and political processes that mediate the productive stagnation or improvement. It is important to start from the concept of total productivity that includes land, labor and capital. And from that notion, contextualize total productivity in the chain, family, and institutional processes, and in the social and political processes. It is important to work on diverse innovations. “It is easy to fool the technicians” when the technicians only “seek to comply.” The innovation seeks to break this nefarious technical-producer alliance around not improving. A producer cannot decieve another producer, even more if mediated by his organizaton that mobilizes endogenous resources, and accompanied by institutions that first seek to understand the producers in order to later dialogue as well on the technical-productive aspects. Finally, even though we have developed a broad perspective in this article, the myth of productivity persists: “Devote yourself to the farm, and leave the rest to the market.” It is a myth because the improvement of productivity does not automatically mean an improvement in income, because the production could increase but not necessarily their income, the prices can go up but not necessarily the income of the producer. The bigger challenge is “governing” the markets, which implies also working on the attitudes that we have, the social and political processes, as well as a perspective of the coffee chain. 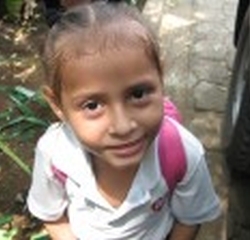 Solórzano, J. y Cáceres, F., 2012, Programa de Mejoramiento Productivo de la Caficultura para Pequeños y Medianos Productores, Managua: FUNIDES, serie de estudios especiales No. 15. Maldidier, C. y Marchetti, P., 1996, El campesino finquero y el potencial económico de . Managua: Nitlapan-UCA. In various parts of the country, many workers go to El Salvador, Costa Rica and Honduras to the coffee harvest due to the fact that they pay them better and because they think there is a different system of measurement (cotton oil cans). This is the case of various cooperatives of el Cuá who together form UCCEI, a situation that is mostly due to problems of organization in the group of UCCEI. In a study for FUNICA, Mendoza, Fernandez, Zamora y Artola, 2011 (Base line for the counterpart organizations of FUNICA), shows also that both organic and conventional coffee with the “fair trade” seal is sold to the traditional market outside the cooperatives. Perez Baltdonado, A., 2004, América Latina. Del Estado Conquistador al Estado Nación: de la resignación a la ciudadanía, en: ENVIO, No. 266. He talks about the Nicaraguan society moved by a providentialist consciousness, that nothing can be done by your own decision and action, but only through supernatural beings like the idea they have of God. For example, some polices are adverse to peasant families. Let see an example related to the environmental law that prohibits – among a number of things – burning. The large producers burn their fields, and on that basis established their coffee plantations, so now they are happy to “not burn.” While the producers of basic grains, by not burning, have higher production costs, and given that corn and beans do not get good prices, the path of respecting the environmental law makes them go broke, sell their land, and if they break the law they appear as “law breakers.” In other words, from the framework of land dispossession, the law against burning contributes to the fact that peasant families are being dispossessed of their lands. For example in milk-livestock, one of the “new” reasons for not increasing productivity is that there is not enough labor force to do the milking, a group of workers that milk between 5-7am, and that have certain skills, but that after 7:00 do not have secure work, and for that reason a good number of them migrate. In other cases, producer members where the cooperatives have invested in large training sessions, due to the power of the “extensive dynamic” sell their lands and go someplace else, which is a loss for the cooperative itself. Others argue that with the migration remittances will come. Each one of these points shows us the complexity of the situation surrounding productivity. Mendoza (2012) explains the “big headed dwarf” of the cooperative movement that focuses resources in the cities controled by the management and technical staff, while the cooperatives persevere abandoned.